There’s the luck of the Irish, and then there’s Murphy’s Law, which is basically what’s been happening to the Bulls of late, the latest in Tuesday’s 90-86 loss to the Washington Wizards. And what more appropriate place these days than the nation’s capital? With Joakim Noah, Marco Belinelli, Richard Hamilton and, of course, Derrick Rose still out injured, Taj Gibson rejoined them with perhaps another MCL strain that the last time last month had him out 10 games. Gibson was slated for an MRI in New York Wednesday. But the way he described the pain and injury it seemed doubtful he’d play again in the regular season. So missing basically their defensive front court that closes games without Noah and Gibson, the Bulls after falling behind Washington 82-78 with 4:47 had Kirk Hinrich ejected on what seemed like an overreaction by official Sean Corbin. It happened to come after Nazr Mohammed, who had season highs of 12 points and 12 rebounds in 36 minutes, was called for offensive goaltending (yes, again against the Bulls like the Noah play against Denver) in what would have been the go ahead score with 3:19 left. Hinrich was questioning his own drive and getting hit and Mohammed appeared to tip in. And though Hinrich didn’t offer what he said to draw two such quick technicals, it did seem suspicious given noted emotional official Joey Crawford was the lead official and called nothing against Hinrich. That also took out the team’s best perimeter defender. So it was John Wall with 45.9 seconds left in a tie game who made the winning play, breaking down the perimeter and Jimmy Butler with Hinrich out and passing to Nene, who drew the defense and dropped the ball inside to Emeka Okafor for a dunk and 88-86 lead. Butler then missed a 20 footer with about 30 seconds left. The Wizards got inside again, drawing a foul and getting to the line with eight seconds left to clinch the game with a pair of free throws. Oh, yes, the free throws. There were two more late ones missed by Butler, with 2:57 remaining and the Wizards leading 84-82. Oh, yes, Robinson, who had 17 points off the bench. But Robinson, an 80 percent free throw shooter, missed both of his with 1:27 left and the Wizards still hanging on, this time ahead 86-84 just before Mohammed tied it at 86 with 56.6 seconds left with a short bank shot. The Bulls fell to 40-33 and are now sixth in the Eastern Conference with a game against fourth place Brooklyn Thursday. Which raises an intriguing question given the Bulls have just nine games remaining, have clinched a playoff spot and have a four game lead on eighth place Milwaukee and likely the tiebreaker. So what exactly do you play for the rest of the way? Perhaps it’s time to sit Luol Deng, who had 13 points and eight rebounds, iron man Boozer who leads the team in starts, Hinrich, who has had his share of injury problems. If it’s about the playoffs, and the Bulls are in the playoffs. And they basically avoid a first round matchup with Miami by winning a few games to stay out of eighth and fourth or fifth. And six of the last nine are against teams with losing records. Then do you find out who Malcolm Thomas is? Give Marquis Teague a look as he plays well around Final Four time? Reward Vladimir Radmanovic for being a solid teammate all season? Keep Daequan Cook out there until he gets his shooting percentage to 30? This subject came up before the game as Thibodeau was going through his regular inventory of injured Bulls. There’s been an epidemic of mystery injuries going on around the NBA, particularly with teams that have mostly clinched positions. The Heat again Tuesday sat LeBron James and Dwyane Wade as they did against the Spurs Sunday. The Spurs, of course, have been notorious several years for holding players out late. And even teams like Boston toward the bottom of the East playoffs have been giving players rest days, like Paul Pierce this week. I’m generally against this as I feel players and teams owe a responsibility to the game and to the fans who pay so much for tickets. But those same fans also seek playoff success, and you have less chance of it occurring if you don’t have your full complement for the playoffs. “Everybody is different,” said Thibodeau. “It depends on where you are with your team. If you have a younger team you probably play a little bit more. If you have an older team you’re looking at rest, maybe a tweak here and there. The challenge becomes when you rest. Sometimes teams will rest guys at the end and lose rhythm going into the playoffs. So you’re seeing now the rest is coming a little earlier so you can play more at the end to have some rhythm going into the playoffs. It all depends on your team and where you are injury wise. So play into a higher level of competition? Or back off now knowing so many players are not only working through physical issues but increased playing time as a result of all the other injuries? Thibodeau, obviously, has never been one to back off any game, which you have to admire about him and one big reason the Bulls have been so successful under him. But perhaps this one time? It could be the biggest question facing the Bulls these last two weeks of the regular season. This was a game Tuesday even with all the injuries and Gibson going out early that the Bulls shoulda/coulda/woulda. He’s running out of deputies, though. Thibodeau has talked this all season, and it’s a credit to the players the way they don’t seem to flinch no matter who plays. It’s not that simple with, as Boozer noted, changing matchups given the missing players, changing rotations, Mohammed playing his most minutes in three years, Butler averaging almost 43 minutes the last four games. But the Bulls basically finish games with the defense of Noah and Gibson, both of whom are out again. “It’s disappointing, but we’ve got to keep plugging,” said Hinrich. “Nine games left. We’ve got to crank it up and play better basketball, find some consistency. Defensively, it’s another big blow (losing Gibson). We’ve got to hang together, find some bodies. The guys out there are going to have to step up even more. We’ve been shorthanded all year. It’s nothing new to us. Especially against a Wizards team, though 28-46, but now healthy with eight straight home wins and 23-18 since Wall’s return from injury and 14-7 with Wall, Nene and Bradley Beal in the lineup. Wall had 27 points, nine assists, eight rebounds and three blocks, and was making a mid range jumper we haven’t seen much. He is as fast as advertised, a one man fast break, Robinson said. And he did break down the Bulls often, mostly getting to the free throw line for 11 of 13. He’s going to get his max contract extension, and maybe he’s not just a track star playing basketball after all. 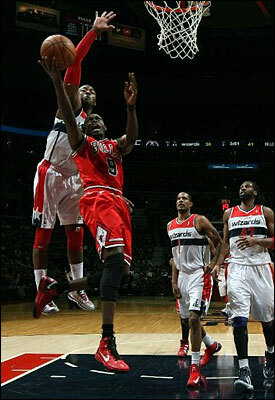 The Bulls mostly controlled the other starters, though in playing small the Wizards matched that and fellow guard A.J. Price had 13 points in about 20 minutes with three of four three pointers. That is rubbing it in. But with the injuries piling up, the Bulls have fallen to tied for seventh with Miami in opponent field goal percentage, just behind the Wizards. Though Washington is hardly the old Bulls or Pistons as the Bulls got off well, leading 24-18 after the first quarter. Deng continued his good shooting, at least early, and Boozer again was finding his spots and his jumper, including a beautiful drop step move for a layup around Kevin Seraphin. Butler struggled some with his shot, but did get a late first quarter three and Mohammed has been something of a revelation after not playing much this season. The 35-year-old veteran playing against Nene and Emeka Okafor showed a hook shot, deceptive movement and strong board play. The Bulls were mostly in control early in the second quarter as Robinson found Butler for a lob dunk and Robinson had another of those spurts that have helped drive the team’s offense with eight second quarter points as the Bulls went to half time leading 49-42 and despite Martell Webster’s analysis not having much trouble holding down everyone but Wall. But it was a brutal third quarter for the Bulls that continued into the early part of the fourth as their offense was staggered. The Bulls went more than nine minutes from late in the third into the fourth quarter with seven total points as the Wizards took a 70-69 lead into the fourth and 79-75 lead about halfway through the fourth quarter. But it was the Bulls unusual lapses in hustle and energy with Noah and Gibson out as Washington players beat them down court several times for scores. Still, there were oh so many chances with the missed free throws, the technicals and the tipin that wasn’t. But it was just one of those games where nothing seemed to go right and nothing good happened.